Aluminium PCB with high thermal conductivity for fast heat dissipation. Aluminium extrusion for fast heat dispassion. Available in 1ft, 2ft, 4ft, 5ft, 6ft, 8ft. Available in T8 end cap or T5 end cap. 0,5kv build in surge protection. Have your logo put on tube light. 2.5kv surge protection built in. Protection: Short circuit, open circuit, over voltage and over heat. The T8 Premium Series is manufactured with white non-rotatable end caps, the Premium Series logo, a frosted milky or clear cover lens, 26mm Aluminium housing and it is powered with live and neutral on one side. 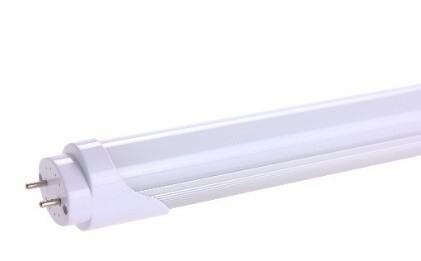 The Premium Series LED Tube comes with a 5-year warranty. Lm/w output is >110. There are upgradable and customization options for the T8 Premium Series. GL lighting is proud to present to you our T8 Premium Series Tubes. The “Premium Tubes”, as they are commonly known, come in a 4.5w 1 foot, 9w 2 foot, 13w 3 foot, 18w 4 foot, 23w 5 foot, 27w 6 foot and 32w 8 foot. We are based in Edenvale, Johannesburg, South Africa. 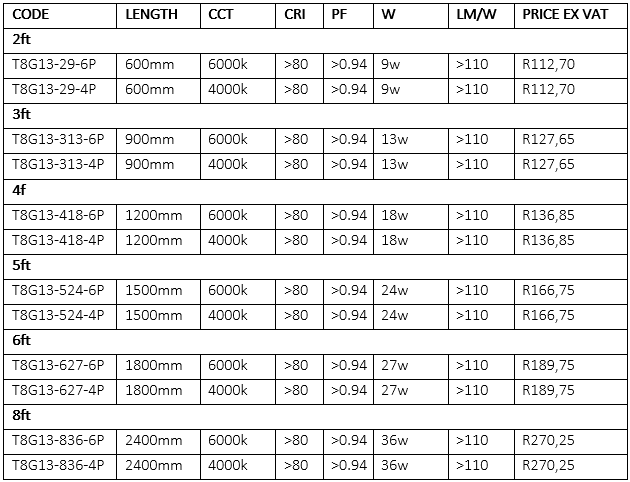 We supply LED lighting to the Southern African market including Kenya, Botswana, Nigeria, Congo, Mozambique & Namibia. The entire South African geographic area is also covered including but not limited to Cape Town, Durban, Pretoria, Polokwane and Kimberly. These Premium Tube lights come with a 5-year warranty. For more information on our Premium Series lights please do not hesitate to contact GL lighting at www.tubelights.co.za or info@gllighting.co.za.